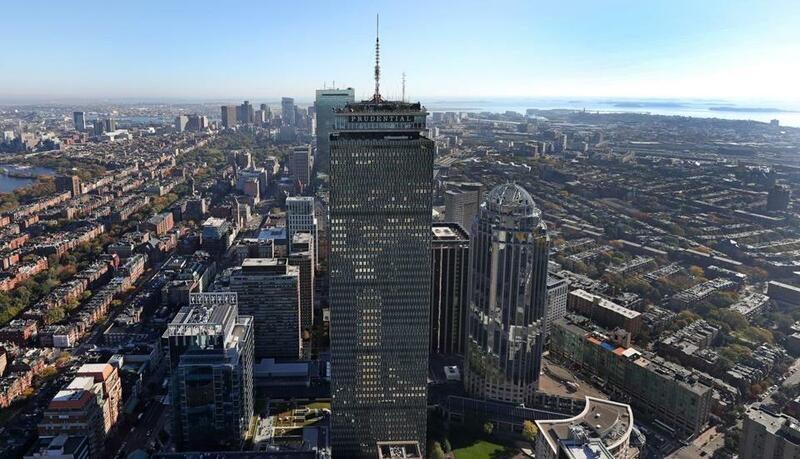 Boston police say a window at the Prudential Center (center) was damaged during a Sunday morning shooting. Two Boston men were arrested early Sunday after they allegedly fired a gun in Back Bay and damaged a Prudential Center window, police said. Mario Escobar, 28, of Roxbury, and Carlos Perez-Mejia, 25, of Jamaica Plain, were arrested by officers who responded to a radio call of shots fired in the area of 867 Boylston St. and found a car fitting a description of the suspect’s vehicle, Boston police said in a statement. After locating Escobar and Perez-Mejia, officers removed them from the car, and found a 9mm Ruger gun in a bag underneath the passenger’s seat. “Upon further investigation, detectives were directed to the building located at 888 Boylston St. where they located ballistic damage to one of the windows,” according to the statement. Both men are expected to be charged with unlawful possession of a firearm, unlawful possession of ammunition, carrying a loaded firearm on a public way, malicious destruction of property, and discharging a firearm within 500 feet of a dwelling. Escobar and Perez-Mejia are expected to be arraigned at Boston Municipal Court.